Luca's School Xmas Fair is creeping up on us, this Friday. Games, raffles, cake, mulled wine, face painting, Santa's Grotto and more seems to be the answer. We have been asked (for who ever fancies it) to produce some cakes/pastries/sweets for the stalls and as I love any excuse to bake, I've tried something new. Super quick to make, and in fact, no actual baking required. You just melt the white chocolate (in a heat proof bowl over simmering water). Once the chocolate has melted, take it off the heat and add the marshmallows, dried fruit, pistachio nuts if you like... pour it all in an oven dish lined with grease-proof-paper and let it set/cool for a good few hours. I stuck mine in the fridge, once it had cooled to speed up the process. Add some Pistachio nuts too if you like. 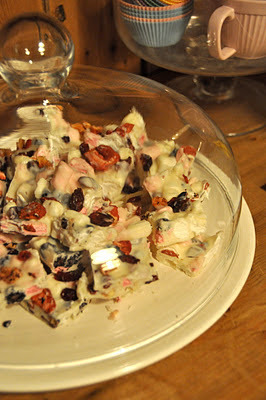 Once totally cooled and hardened, remove from the baking trey and chop the Rocky Road into squares or rectangles. Done... ready for the Christmas Fair!! !